Everyone who submitted a log for the CQ WW DX Contest SSB 2013 has been mailed an encrypted link to view their Log Checking Report for the contest. The reports were sent to the email address that submitted the log and to any email address included within the log (using the EMAIL tag). If you have not received your report, please check your spam filters. You can request the link at: https://cqww.com/contact. It is rather remarkable that almost 82% of the 5 million contacts reported were able to be cross checked with other logs. Thanks to everyone who submitted a log and helped make this level of cross checking possible. Even more amazing is that 97.1% of those contacts cross checked as being good. The log checking report provides full details on how the final score for each entry was calculated. It shows the raw score before checking and the reductions. Each Not-In-Log, busted callsign, and busted exchange are listed. Unique QSOs are also listed for information purposes. A unique QSO is one with a callsign that was not reported by any other station. Over half (51.3%) of these were found to be busted calls. But, experience says these unique QSOs are probably bad calls more than 90% of the time. 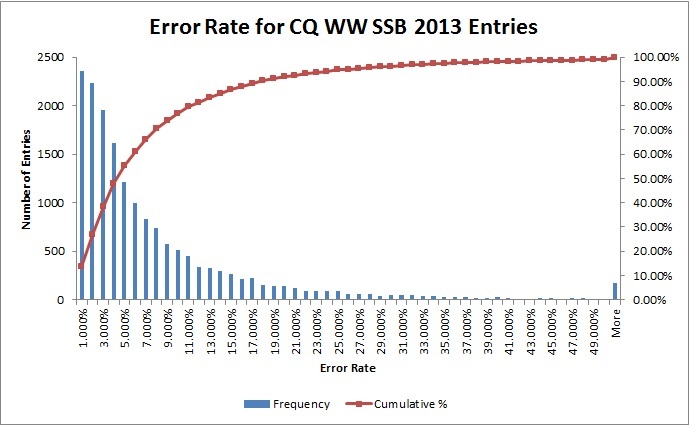 We have introduced a new Error Rate calculation to the reports this year. This number represents the percentage of contacts that were found to be in error. It does not include duplicate QSOs. This number is a more accurate representation of accuracy than looking at the percent score reduction, which can be much higher for smaller logs where the penalties and lost multipliers can have a higher impact than they do for large logs. You can see the Error Rate number as part of the score summary section. The average Error Rate for all logs was 3.60%. Use the chart below to see how your error rate compares to others. The blue lines show the number of logs with that error rate. The red line shows the cumulative number of logs at that error rate or lower. Someone with a 9% error rate was in the top 73% of all entries. Please send any questions or comments at: https://cqww.com/contact. How fast do people send in WW CW?